Completionist and procrastinator - proud owner of a 99% AGC. Plan to complete (just about) every achievement game I own, eventually. I tend to avoid multiplayer and “spam” games. I will not play any game with broken achievements. I don’t mark non-achievement games as completed, and will only do so if I’ve achieved 100% completion. But all in all I had a good time, I was impressed by just how massive the game was, and how much there really was to do! While playing, I encountered a lot of bugs, but nothing game breaking, just my children getting in the buff when I gift them clothing, or the occasional guard dropping dead and whatnot. I nearly didn’t finish the game this month, but I powered through it and got a lot done in a little time. Very little motivation to do much as of late, been going through some really tough times, and dedicating so much time to this game just to finish it before a non-existant deadline probably wasn’t worth it. But, I’m glad I got to play this game, even when the scale proved itself to be rather intimidating, and honestly made me feel a little anxious being unable to complete absolutely everything, though completing all the achievements and quest lines gave me enough closure to put it down for another day. Luxor HD is a marble shooter/match 3 style game where you must destroy a line of orbs before it reaches your pyramid. If you fail, you lose a life, and must restart the stage. Seeing as I had won this game on SteamGifts, and that it has been praised for being rather relaxing, I thought I would give it a shot. But wow is it tedious and frustrating. The game’s campaign is so overly long, and really not very fun after a while. (5 hours in and I was sick of it, took nearly 10x that long to get the last achievement!) Mind you, this game’s achievements are purely in-game, but that didn’t stop me from needing that 100% to be satisfied. The achievements consist of beat X difficulty or perform X action/combo/accuracy requirement. 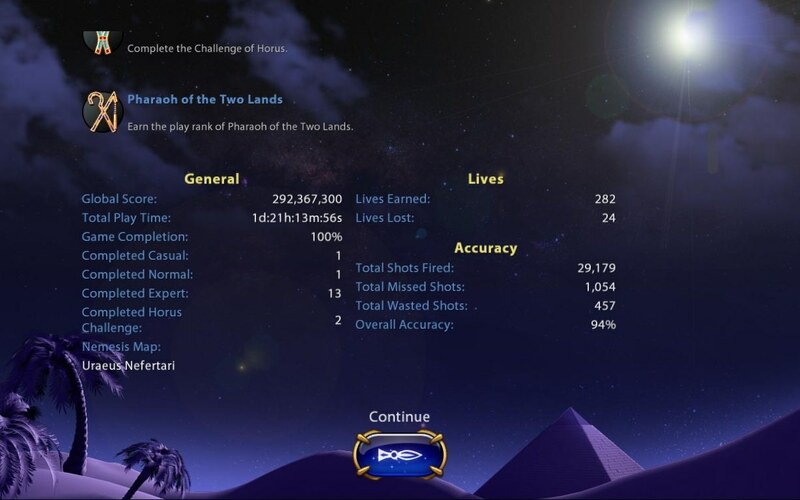 Simple enough, but the final achievement requires reaching the game’s highest rank - Pharaoh of the Two Lands, a 280,000,000 point requirement! This took AGES, and was not worth the time whatsoever. But, it’s done, thankfully. Now that that’s finally over, sadly the struggle doesn’t end there. The preparations I recently made for a Skyrim: Special Edition 20,000 achievement / 250 hundo sync were not worth the trouble. Two games I’ve previously completed removed a total of 17 achievements from their games, and now the completion of Skyrim will not do what I intended, unforunately. Stupid that I spent the time to make it happen, but what can you do? Recently made some preparations to sync up a Skyrim (Special Edition) 100% to hit 20,000 achievements and 250 perfect games. Will be starting Skyrim this weekend, hopefully. I’ve never actually played Skyrim before, but I’ve heard great things over the years, so I’m looking forward to it! Getting Over It with Bennet Foddy is a game about grit and determination. A man in a pot, Diogenes, is faced with the task of climbing a mountain solely with a Yosemite hammer. In doing such, at any point, you may lose hours of progress upon encountering one of the game’s many pitfalls or awkward obstacles. You fall down again, and again, and again, but despite that, something drives you to just keep going. A quote within the game, by Mary Pickford, states “Failure is not the falling down, but the staying down.” Short, but grand in effect. It made me keep going, despite my mistakes, despite the setbacks. This game is truly a work of art; I’ve yet to find a game that encapsulates my passion for determination like this has. This is the first game I’ve completed in 2018, and I think it’s fair to say it was a good start. December 2017 was the most completion dense month I’ve had since joining Steam, I’m proud to say! I’ve completed 41 games this month. Luckily enough, I completed one of my favorite games of all time, and my favorite game of the year, even managing to earn the first 100% in the world, with the quickest playtime - OKAMI HD is a gem that everyone should play, I had a fantastic time reliving this childhood favorite, a masterpiece of games. As I learned of BLAEO’s services, I had the incentive to actually play my SteamGifts winnings for the first time, though my progress wasn’t much considering the luck of this month, seeing as I won twenty-nine giveaways this month. Here they are, however. Thankfully, some overlaps from my enjoyed games. Progress is progress. Can’t fail to mention the much more mediocre bunch of games I’ve completed this month. Most of these games aren’t too bad, but a few are pretty unbearable. And lastly, a nod to a non-achievement game, Doki Doki Literature Club, a wonderful experience. Thankfully, I did not have the game’s surprises spoiled for me, and I hope anyone who hasn’t played it yet has managed that themselves. That wraps it all up, thanks for such a nice first month at BLAEO - I look forward to many more! Beginning Dark Souls II: Scholar of the First Sin today - about time I knocked something off the backlog. Wish me luck on the 100%~!